Celebrate and support one of the most important aspects of womanhood, menstruation. 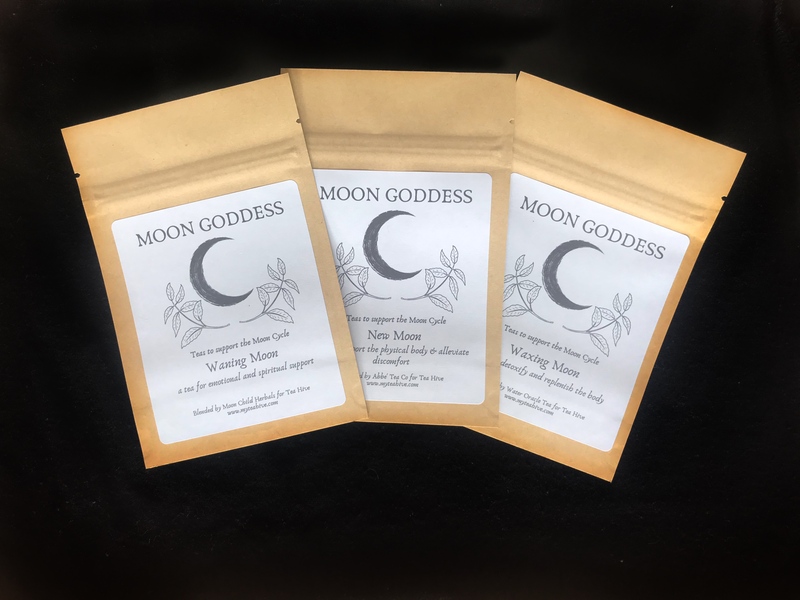 These three herbal teas are made with all the best herbs, flowers, and fruits to nourish our bodies during the process of shedding and rebuilding each month. Collection Includes: -	WANING MOON: a tea for emotional and spiritual support Lemon balm, chamomile, oat straw, rose, sage, and lavender -	NEW MOON: a tea to support the physical body and alleviate discomfort Raspberry leaf, red clover, turmeric, cinnamon, cacao, pink peppercorn, skullcap, safflower, rose, vanilla rooibos -	WAXING MOON: a tea to detoxify and replenish the body Rooibos, tulsi, hibiscus, acai, lemongrass, ginger, cinnamon, Schizandra berries, beetroot, orange peel, mango These three teas are organic, caffeine-free, and crafted with love and attention. Set contains ~1 oz of each tea and makes approximately 30 cups of delicious tea.